The journal entry I wrote yesterday is online (click here to view the .pdf.) The first page is a bit blurry as my journal is bulking up a lot; a thick journal is tough to scan. 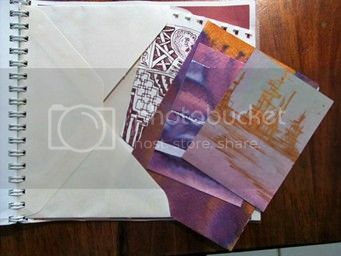 You can hear a bit about Father's Day with my guy, a request from a friend, a pic of my progress on the black and white market bag and some art experiments. I definitely put a lot of artwork in my journals. It's a private place where I can express myself without the stress of having anyone else look at my little sketches, paintings and sewing projects. My writing is very public, and I am happy to share it (kind of the point) but my art is quite personal and off-limits. This is how I relax and work on artistic ideas that are just for me. Generally I am not interested in showing it off, getting feedback or inviting anyone else to participate in the process. I know how selfish that sounds, but I need this so I can recharge my batteries, maintain my sense of wonder and have something completely safe from the pinheads of the world. I've found that's really important in my creative life. We have very little privacy anymore. If we're not being barraged by the internet and social media, we're being pestered on smart phones (well, okay, you guys are. I don't own one.) Advertising is constantly in our face. I can't even watch the weather channel for forecasts anymore because they turn everything into a natural disaster of epic proportions in between commercials for weather-proofing products. A journal is one of those rare places where we can actually have some time, space and peace to think for ourselves. Unless you have no soul there are things in your heart you want to explore creatively, but you're afraid to, or you don't think they're important enough, or you don't want anyone else to see them. A journal can be a secure vault for these ideas. It can also preserve them for the future. You've seen the sketches I've done in my entries. This week I had enough time to work on them a little, but if I hadn't I could have gone back to the journal. You may also want to let your art percolate a bit more, or refine the idea, before you try it in real life. 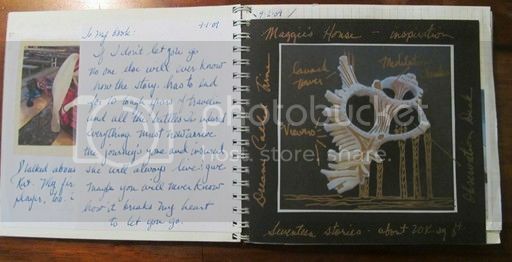 Think of your journal is your secret art studio, and I bet you'll start filling it with all kinds of amazing creations. This seashell construct eventually made its way in my novel Dream Called Time. A character sketch, and a reminder to myself to get going with the writing. 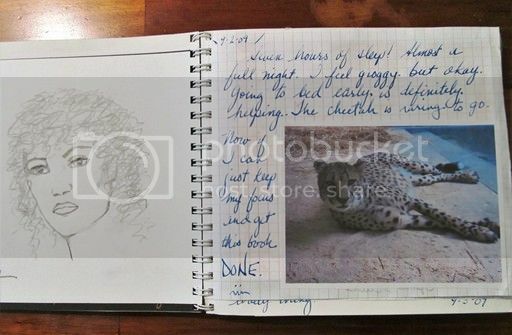 Cheetahs often show up in my journals. 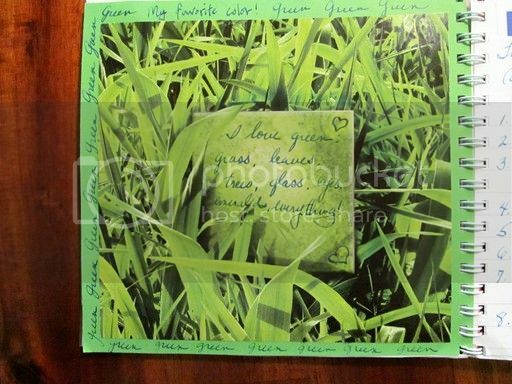 A pretty picture I cut from a magazine, celebrating my love of the color green. Two little watercolors that I painted just for me. Tomorrow we'll talk about ways to make interesting covers for your journals.